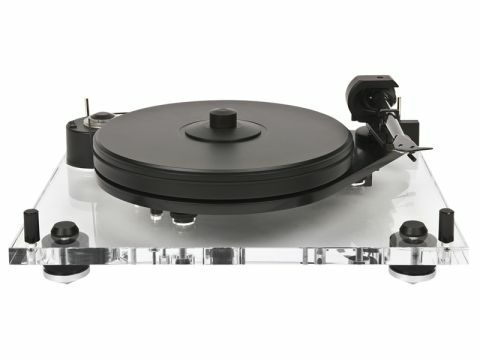 Joy of joys – the Pro-Ject 6 Perspex is a turntable with a lid, which even if it doesn't quite enclose the whole machine, will certainly reduce the dust problem considerably. Beneath it resides a suspended turntable with some interesting ideas built in. The Perspex of the name is hardly a surprise these days, but the subchassis is made of Corian, a material which Pro-Ject claims has 'no resonances at all'. We'd question that, but it does seem to be less resonant than the more common MDF and it looks smart, too. It's supported on a rather stiff suspension which turns out to rely on magnetic force rather than springs. Magnetic suspension is not by any means a cure-all and is difficult to get right, but this implementation seems to work very well. It doesn't fix all the problems of conventional suspensions and, for instance, the subchassis of the 6 Perspex is very willing to yaw, or rotate about the spindle. However, if provoked externally it seems to bounce vertically rather than twisting, which is all to the good. An AC motor is used, fixed to the chassis and therefore not suspended, and it drives the edge of the platter via a square-section belt. The 9cc Evolution arm fitted to this deck is something of a beauty. It's made of carbon fibre composite material and is conical, which helps reduce resonance. As our photo shows, it has a truly huge bearing yoke which contains precision ball races in a gimbal arrangement, which gives a great combination of structural rigidity and freedom of rotation, but does mean that the bearing axis is a little too high. Flexible wires from the arm lead to a pair of phono sockets: Pro-Ject includes interconnects but does not supply a cartridge as standard. The 6 Perspex was much enjoyed by two listeners but less so by the third, who identified a slight lack of bass as his main concern. The odd thing here is that the low bass is, according to our own listening, a touch on the over-full side, but higher bass and low midrange does seem a touch shy, if only by comparison. But the overall effect clearly pressed all the right buttons for the two who liked it. Dynamics are a particularly strong point, wide-ranging but absolutely natural-sounding. We've all heard hi-fi components, particularly turntables, which have great dynamic extremes but seem oddly lacking in the middle. This one is beautifully balanced across the board, with dynamic swings which happen smoothly and convincingly. There's plenty of insight, too, aided by a tonal balance that's just a shade lifted in the highest treble, bringing out the best in well-made natural recordings. Imaging is wide and fairly deep and a hint of depth compression is one of the few weaknesses we could put a finger on.